On 25 May, Enactus Ireland supporters met in Dublin to share ideas, make new connections, and learn about the impact made by teams over the past year. 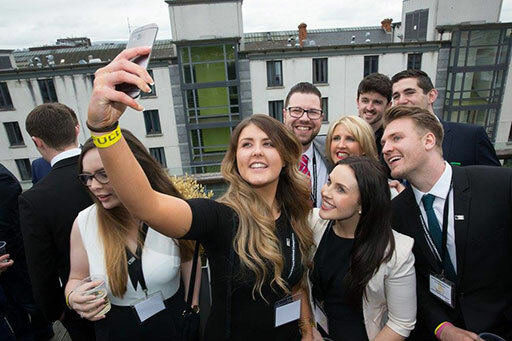 But it wasn’t the first time many of them had been together: six weeks earlier, Enactus Ireland staff held a Pre-Competition Summit where all nine teams came together with leaders from sponsor companies to prepare for the competition and how to maximize the experience. Read all about the day in this blog post written by Enactus IADT. 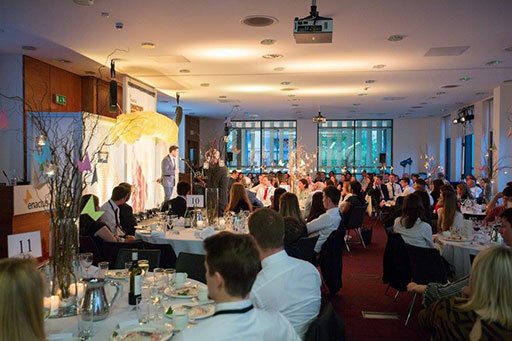 Finally, competition day arrived and 273 student, academic and business leaders came together at Chartered Accountants’ House Ireland. The festivities kicked off with an introduction and parade of the competing teams, followed by an inspiring keynote address from Neville Bourke, Head of Human Resources for Bank of Ireland, who spoke about the importance of students who showcase their passion, energy and enthusiasm to create real community impacts. He complimented the students for their commitment to the Enactus program and wished them all the best of luck in the opening round of competition. In the first round, presentations from the nine competing teams were evaluated by 47 judges, who had the challenging task of selecting the final four teams. Throughout the competition, social media was abuzz with posts about the amazing impact made by the teams – search by the event hashtag #EnactusIRE16 — which was trending all day in Ireland — to see for yourself! Speaking of social media, the four Enactus Ireland social ambassadors did an amazing job sharing the highlights of the competition online. From the opening ceremonies to the final address, they covered it all – great job, Ciaran, Dominika, Aideen, and Darragh, and thank you! Over lunch, attendees were treated to a fascinating panel discussion featuring leading business women that explored the importance of creating social enterprises. Panelists included Dil Wickremasinghe, Social Activist and Radio Presenter for NewsTalk; Iseult Ward, Founder of Foodcloud; Jane Feighery, Development Manager of Social Entrepreneurs Ireland; and Deirdre Mortell, CEO of Social Innovation Fund. Once again, delegates took to social media to share the love for this panel! After lunch, everyone came back together for the announcement of the final four teams and the final presentations. 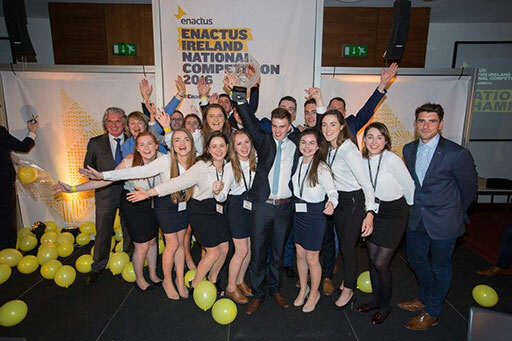 The 34 industry leaders serving as judges had the difficult task of selecting the 2016 national champion: in the end, they chose the team from Dublin City University, who will now prepare to represent their country at Enactus World Cup in Toronto this September. The team presented a number of impressive projects including Prisonbreak, where the team helped an ex-convict establish his own fitness boot camp business; Camphill Crafts, which helped people with intellectual disabilities start a craft business; and HeadstARTS, an initiative that provided a creative outlet for individuals with intellectual disabilities through dance, drama and art classes. As a grand finale, attendees were treated to a closing address from Bernard Brogan, a popular Gaelic Athletic Association star who shared his message on the importance of working with young people. 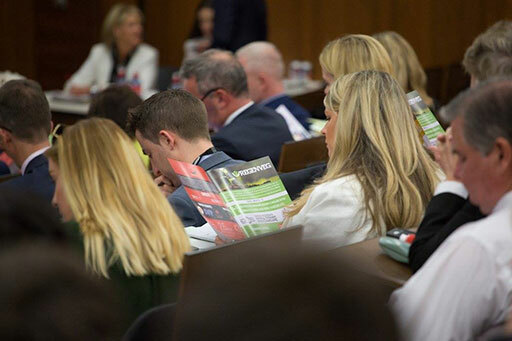 The event was supported by an incredible group of leading companies including KPMG, Bank of Ireland, Abbott, AIG, Arthur Cox, Cartrawler, KBC, Enterprise Rent-A-Car, New Ireland Assurance, Musgrave Group, Microsoft, Unilever, Merc Partners, The Ireland Funds, Willis Towers Watson, HSBC, and Oracle. What was really great about this support, however, was how active the companies were in their involvement. From sending executives to the event to tweeting words of encouragement to the teams, it was clear how committed these organizations are to the success of the students. Communication Partners, Havas, also did an amazing job spreading the word of Enactus in the lead up to, during and after National Competition. 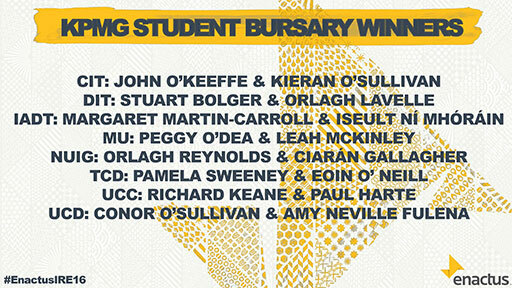 And KPMG even sponsored a bursary to send two students from each team to World Cup this fall – amazing! 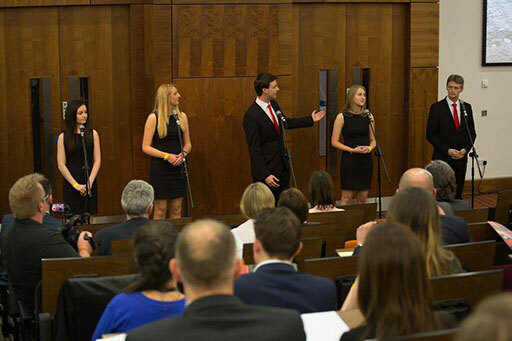 What was your favorite moment of #EnactusIRE16? Share in the comments! And don’t miss all the highlights from this great event, captured in this flashback video! Beyond impressed at ideas that have been put forward so far @enactusIreland #EnactusIRE16 It’s fair to say that #WeAllWin ! !